It’s been a month since the Initiation Program mandate started taking effect and many players were introduced to cross-ice hockey for the first time. Change can be tough to deal with. 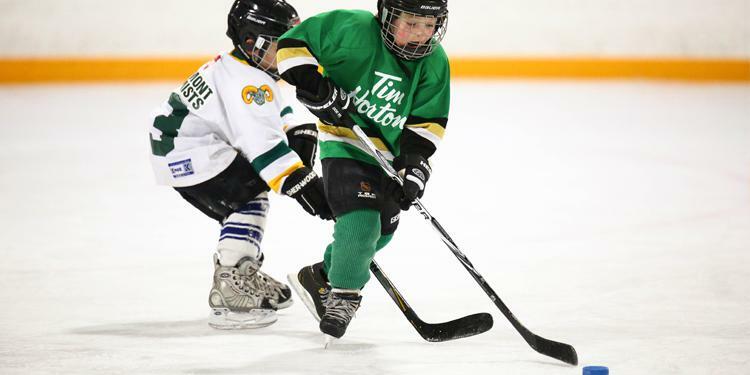 While there was initial concern from some about how cross-ice hockey would affect children’s hockey experience, for many it was a just matter of seeing it in action and how players positively reacted to having more puck touches and playing on an age-appropriate ice surface. 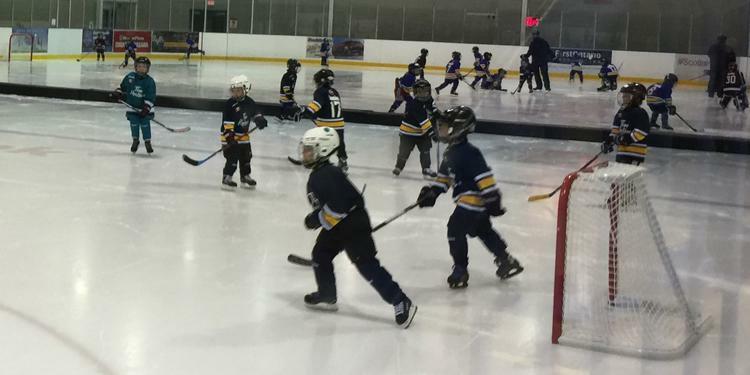 We spoke to volunteers from three local minor hockey associations to detail their experiences with implementing cross-ice hockey. The cross-ice rink boards set up in Kent. How have you seen players benefit from playing cross-ice hockey? Mike Hendrickson: They’re all involved in the practices and the drills because they’re not on this huge surface. They’re in a smaller centre, a smaller group, everybody is involved. The weaker kids, instead of struggling to keep up, are right in the middle of things. Rob Matthews: I would say without a doubt, our players have their heads up more, the agility on their skates, their edgework, starts and stops, that stuff’s all vastly improved over kids who played full ice. My son actually played full ice, I’m kind of jealous, he missed out on the good stuff. I’d say in general, puck movement and the instinct to protect the puck is stronger. 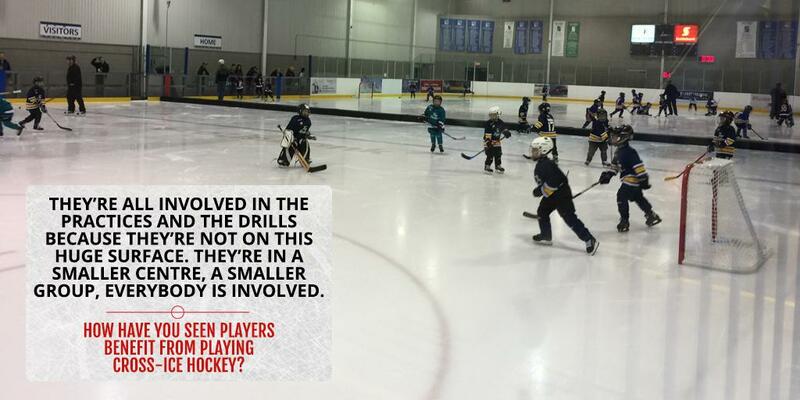 They have less time, less space so they’re actually reacting more like what you’ll see out of older kids… Our kids actually are engaged in puck handling at all times. It just builds natural hockey instincts… You’ll see our kids that played half ice behave more like what you would expect out of a hockey player. Their first instinct is look up and pull the puck away from traffic and maybe even look to dish it, which is something you traditionally didn’t get out of your six and seven year olds. Alana McCannell: Some kids who were on the team last year on the full ice games that didn’t necessarily get as many puck touches, they didn’t have the confidence to go after the puck, even their speed, their agility, they were there but they weren’t performing at the level they are on cross-ice. In cross-ice, I’ve noticed huge improvements, even the few times they’ve been on the ice, with just their confidence, number one. They’re touching the puck a lot more, they’re more driven, it doesn’t seem almost so far away. For some of them last year, I think, it almost seemed like the puck and everybody else was that much further ahead of them. There was so much more space to go so they didn’t have the drive to go after it. Whereas now in cross-ice, they’re getting the puck, they’re scoring the goals, they’re using the things that we’re practicing, the tight turns, the balance, all of the agility stuff. It’s really coming into play. Again, with heads-up hockey in a smaller space, it’s really teaching them, you’ve got to keep your head up, you’ve got to know who’s around you. Those fundamentals that they can bring up to the next level next year when they’re a little bit bigger and have mastered all of these skills. They’re touching the puck, they have to be engaged because it’s a small area. They’re talking to one another which I think as a coach is one of the most important things team members can do to one another is communicate. They’re able to hear one another. See their passes and distance, everything is in relation to where they’re at developmentally. Can you describe how the ice is split using the boards? RM: So far, we’ve actually run our boards across the blue line and used that as a cross-ice game while we do practice stations down at the other end. A lot of skating work, basic puck handling, a couple of games. It’s lots of stuff you’ll see in the IP Handbook and some homecooked ideas just over experience. MH: It’s half, right down the red line. They have a playing surface of about 60 feet by 85 feet. How many kids are on each half-ice surface? AM: We usually have enough kids to run three games of 3-on-3 or sometimes 4-on-4. We start off practice with a warmup and then we do stations. 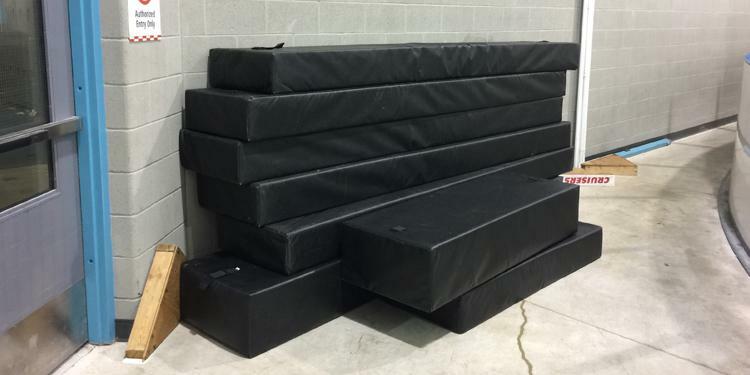 Depending on how much help we have that week, we always have our coaches out there, we usually run three to four stations after our warmup and then we get into our games. MH: Approximately 24. The coaches usually run two or three stations. RM: We do teams of 11, so at any given time it’s 5-on-5, half-ice. There’s 22 kids per half. That’s for when we scrimmage. 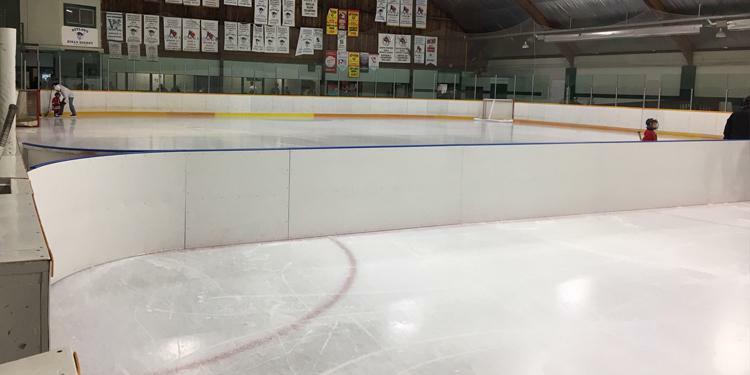 Some rink boards that can be used to help divide the ice. "I would say without a doubt, our players have their heads up more, the agility on their skates, their edgework, starts and stops, that stuff’s all vastly improved over kids who played full ice." What is the implementation and set up process like for dividing the ice? MH: When we first got it, it looked like it was going to be a daunting task because you’ve got all these jigsaw pieces. Actually, it goes together very, very simply. We’ve got two guys off ice handing it to two guys on the ice and we have it up in 13 minutes and that was the first time we did it. It’s all very simple to use. And the teardown was even faster. It all goes onto a storage cart and we just wheel it off into the corner… It looks like it’s daunting but it’s not, it’s very simple. Realistically, the dividers just roll up on a cart and out of the way. When it’s secured in place, it’s as secure as the sideboards. We don’t lose control of the pucks, kids bounce off the boards, they’re not skating into the other group. Like a game, they can bounce the pucks off the boards. It’s their own pad. RM: I was very concerned going into the season about the boards setup. We found a morning where the ice was going to be empty and got a bunch of coaches together and we went over, put them up, take them down, put them up, take them down a couple of time to get the flow. It’s pretty clean right now just based on where we’re able to store them. Storage was the biggest factor for us. We’re storing them in the rink they’re used on, rolled down to the door. They’re about seven or eight foot pieces of board. We roll them on the ice and they have little pegs that hold them together. Each individual board stands up by itself and you just slot them in together. There’s a tensioner at each end that you apply. AM: Usually when the head coach is running the warmup, one of us will grab the boards. We just keep them on the side of one of the team benches. We grab them and put them on the ice, use them as we are doing our rotations. The kids know you don’t jump over them, you don’t hit them, you don’t cross them unless we’re moving sections. It does not take long at all. What was the reaction from those involved? RM: We took some pretty strong measures to not just sell the fact of half-ice being beneficial but we actually trialed it… We took our Tyke MD teams and what were going to be our Tyke HL coaches who were going to be working within the system of half-ice, brought their kids out and had a Blue vs. White scrimmage. We scrimmaged at full ice, we then cut it down and scrimmaged at half-ice, through 15 minute intervals, and then we scrimmaged at cross-ice. We had spotters in the stands watching for some eye-test statistics. One thing that we tracked was how long does it take for every player on the blue team to touch the puck when a shift starts. On full ice we would see, in a given shift, there would be two players on the blue team who didn’t even touch the puck. At half ice, we noticed it went down to about 20-30 seconds for all the blue players to touch the puck. When we went to cross-ice, it was less than 10 seconds and all the blue players touched the puck. MH: A lot of the reaction from the children, when they went on the half ice with the actually physical barriers, they enjoyed the practices so much more. They lost conception of it only being half-ice practice and they had their own ‘private pad’. Their conception was that they had their own ice surface and weren’t just being blocked off. It’s just a different perception, the kids just come off more happy and giddy about it. Even though it was the same surface they had been using in the years past when we just had pylons or whatever else, putting the actual physical barrier up there and giving them their own pad just made it special for them.